Katusha climber Daniel Moreno tips the scales at around 59kg and he’s riding a bike that just about scrapes into the UCI legal limit of a minimum of 6.8kg. When it comes to an all-up weight package, it’s clear that Moreno and his Canyon Aeroad bike are at the featherweight end of the spectrum. But it could be even better – or certainly lighter. “It’s crazy,” insists his Katusha mechanic Marco Melini, “this is the only sport where the amateurs can have better bikes than the pros! “We can obviously build bikes that are under the weight limit but then we have to add weight to them, which means that the weight balance and handling of the bike are compromised, they just don’t handle the same. Melini is getting quite animated, but as a pro bike mechanic for almost 20 years, you feel he’s earned the right. The previous day, his rider Moreno had sprinted out of the thinning bunch to win the Flèche Wallonne at the summit of the Mur of Huy riding an extra small (XS) Canyon Aeroad frame equipped with 11-speed Dura-Ace Di2, Ritchey bars and stem, Dura Ace pedals and a well-used Selle Italia SLR ‘Team Issue’ saddle clamped to a Canyon-developed seat post. 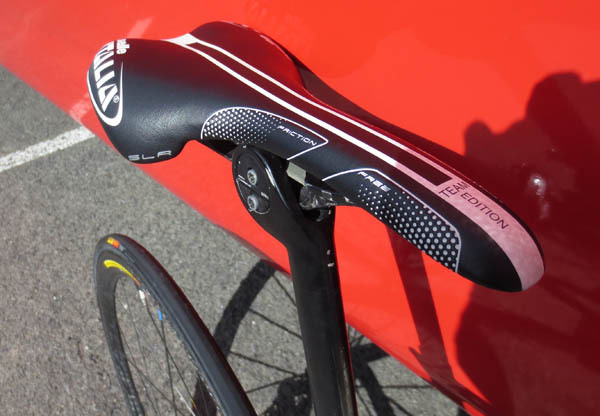 “Because it’s a monorail saddle and the seat tube is aero, Canyon had to develop this seat post,” explained Melini. Most of the other bikes propped up against the Katusha team bus were using more conventional Ritchey posts. 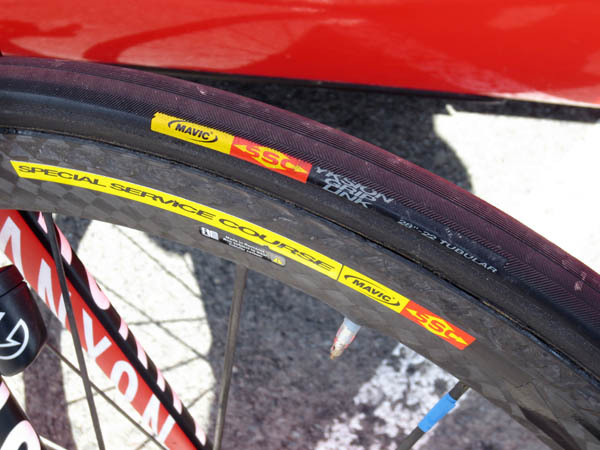 The race winning wheels were Mavic Cosmic Carbons with Mavic SSC tubulars glued to them. Well, they said Mavic SSC on the sidewall but Melini got rather sheepish when it was put to him that they may have been made in Italy or Germany. There was no SRM Power Crank or Power Control box on Moreno’s winning bike, just a very simple Shimano Pro bike computer. In fact, the Katusha riders have two road bike options open to them. The Aeroad frame favoured by Moreno and Rodriguez and the new for 2013 Ultimate CF SLX used by the team’s sprinter Alexander Kristoff (bronze medallist in the London Olympic road race). The lighter riders seem to favour the flatter head tubes, forks and aerofoil shaped down tubes of the Aeroad model and the northern Classics, sprinter types generally rode the Ultimate CF SLX but the choice was down to the rider, there’s no team orders or sponsor pressure. “The Aeroad is the same frame as last year but the CF is actually totally new, new geometry, new tube profile and carbon,” said Melini and it does look like a far more conventional frame from the German outfit. According to Melini though, the bikes are straight out of the mould, there are no special builds, geometries or carbon fibre lay ups though. 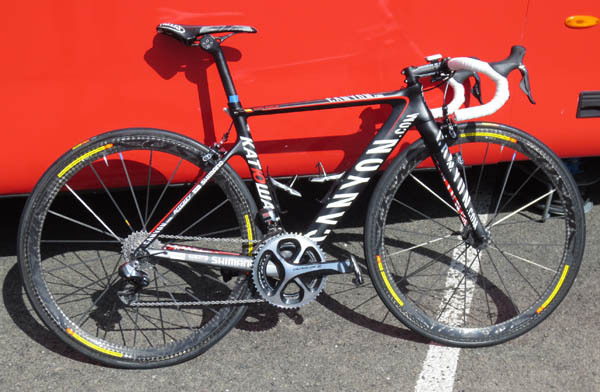 These are the same bikes you can buy from the Canyon website as the German company doesn’t ‘do’ shops and distribution. You buy direct from www.canyon.com. Predictably, the team race on tubular tyres on a selection of Mavic wheel sets. “Again, it’s down to the riders to decide what they want to race or ride on. When it’s windy, the deeper section rims can be tricky, though (Luca) Paolini insists on riding the deepest rims, no matter what the weather and the wind is like,” adds Melini rolling his eyes in disbelief. The day after his triumph in the Flèche Wallonne, Moreno and his team pedalled to Maastricht and back. “It was less than 40 kilometres though it took them hours. Basically they rode to a coffee shop and rode back, but fair enough, after yesterday. “I put different wheels in for them to ride to the coffee shop, still Mavic Cosmic wheels but with aluminium braking surfaces and heavier tubulars. The race winning wheels had lighter, narrower profile tubulars and carbon braking surfaces. 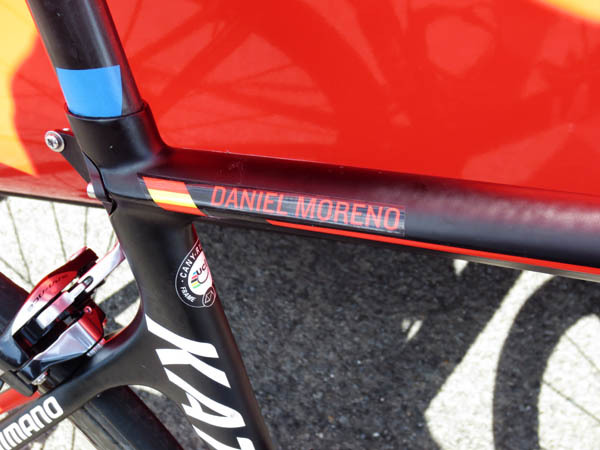 So, was there anything special about Moreno’s bike that we needed to know about? Any top secret parts (other than the Canyon made chain guide that bolts from the seat tube bottle cage bosses to just behind the chain line of the inner ring)? Was he one of the more demanding riders in the team? “Actually no, he’s not. When he joined the team obviously he took a little time to readjust to the new frame he was riding, but once he settled into the bike and the position he wanted, he leaves it the whole season, it never moves a millimetre, the saddle and reach stay as he sets them at the early season training camps. No, he’s OK. I had to work with a rider once who carried a plumb line in his back pocket when he raced, I swear to god! “The whole season he would change his saddle position and handlebar reach back and forward. In races we would do 20km and his hand would go up for service, we’d drive up to him and he’d say he needed to change bikes to his spare, though there was nothing up with it. Why? Why? we would ask. ‘Because I want to compare how they feel!’ He was crazy and never won anything. And he’s not racing anymore,” laughed Melini. Although Moreno and his pal Joachim ‘Purito’ Rodriguez aren’t as picky as that anonymous Italian rider, they both pay close attention to their bikes. “The early season training camps are always busy for the 10 mechanics on the team, it’s a big squad and there are a lot of bikes to set up. We’ve got a spread sheet with the measurements of every rider on the team, on their road and time trial bikes and we use Drop Box to keep everyone in touch with any changes. And, among the myriad of details on the spreadsheet – depth of handlebar bend, width of handlebar, position of brake hoods, distance from the bottom of the bars to the fork drop outs, saddle height and set back, unique to Moreno, we learn that the 31 year old Spaniard’s saddle height is 71.5cm and that his Dura Ace cranks are 172.5mm long. Once again, we are faced with the fact that this is a perfectly set-up UCI World Tour pro rider’s bike, nothing more but certainly nothing less.